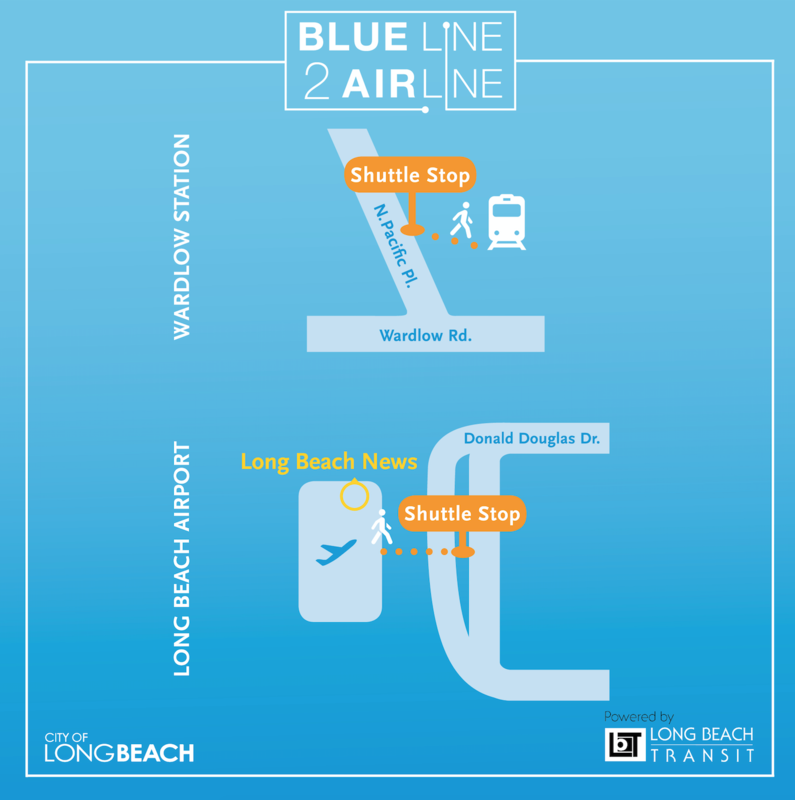 Long Beach Transit and the City of Long Beach will launch Blue Line 2 Airline, a pilot program that provides free express bus shuttle service between the Metro Blue Line and Long Beach Airport, this Saturday, Nov. 18. The Blue Line 2 Airline will offer direct service between the Metro Blue Line Wardlow Station and Long Beach Airport’s historic terminal. Buses will run every 30 minutes from 5:45 a.m. through 8:15 p.m. daily through Jan. 7, 2018. Awesome! Wardlow station is my home station, and LGB is my airport! Your blg is out of date. Not particularly useful to me, under most circumstances, because coming from Orange County, I would get to LGB before I’d reach the Blue Line, but I applaud it anyway, because it’s certainly going to provide a useful airport connection not just for Long Beach residents, but for anybody who lives along any MetroRail corridor. According to the flyer, “The service is made possible through a subsidy from the City of Long Beach to Long Beach Transit”. I don’t really see the point. Blue Line passengers are already served by a direct bus, 102/104, between the airport and Willow station (though it’s neither express nor free). What’s the point of spending city resources on an additional point-to-point express bus, which will likely be highly underutilized? If the idea is to attract new passengers to Long Beach Airport, then it should be part of the airport’s marketing strategy, and that’s not done well at all. I live in Long Beach and haven’t seen any marketing of the new connection by the airport or airlines; now I checked the airport website, and all I see is a link to the flyer from the airport’s ground transportation page, with confusing wording: “Holiday shuttle service connecting Long Beach Airport directly to Metro Blue Line Wardlow Station from November 18 through January 7. Fare is $1.75 at Long Beach News in terminal.” I’m guessing the intention is to say that Metro fare is $1.75, because the shuttle itself is free. There’s also an undesirable side effect: Since the renovation of the Wardlow station parking lots last year, Metro now allows free 72-hour parking for transit patrons. Airport parking is $17 per day, and Wardlow station is right off the 405. So for a 3-day trip, a person could park at Wardlow and take the shuttle to the airport, saving $51 on parking, and taking away a transit user’s space for 3 days. If I remember correctly, the signs at Wardlow are ambiguous as to whether parking is for Metro customers or all transit customers. The station does serve as a small transit hub for Long Beach Transit (terminus for routes 131, 181, 182). Regardless, while the airport shuttle is operated by Long Beach Transit, it’s a contracted service that’s separate from the bus system, so it barely qualifies as transit. I don’t know why the city chose LBT to operate the service — in terms of the number of passengers expected, I suspect a smaller vehicle would be appropriate. But I don’t know what options were available. As a matter of principle, parking at transit hubs is intended to allow an entry point to the transit system to people who otherwise would find it too difficult to get to transit. A person using only the airport shuttle is not entering the transit system. I suspect that if the airport asked Metro about using its lots for airport parking, Metro would either demand a hefty fee or flat out refuse. So using Wardlow for free short-term airport parking is an unintended consequence, but hopefully one that won’t be abused much (because it’s only good for trips of up to 3 days). At LAX, the proposed LAX Automated People Mover (APM) station will require at least one transfer (Blue-Green) to travel between Downtown LA/Union Station and the LAX APM station. On top of that, the LAX APM will require transit patrons to walk as much as 1,000 feet between the APM stations and the various terminals. At least one city is doing is the correct way. I wish that Metro and LAX would come up with a solution that works. One-seat rail between Union Station and Wardlow Station won’t be available until the regional connector opens in late 2021; the LGB shuttle is a holiday operation which ends on January 7, 2018. Besides, why the fixation on downtown L.A.? LGB is a city-owned airport, with artificial limits on the number of flights designed to keep the operation small. I’m sure it welcomes passengers from everywhere, but its primary purpose is to serve Long Beach and nearby communities; places further out are better served by LAX or SNA, and downtown L.A. is better served by BUR. An easy connection to downtown L.A. should not be a priority for LGB. Gee, that only took 27 years to happen.